Louisa Franklin, English professor and director for the Academic Success center at Young Harris College, spoke at Student Government Association’s Last Lecture last Tuesday night. 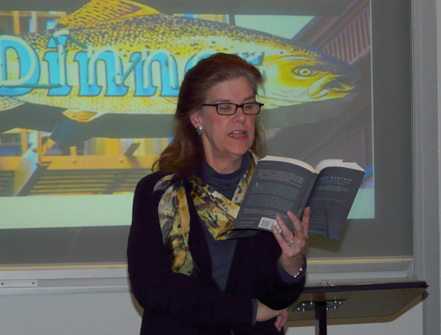 Franklin’s lecture entitled “Breakfast, Lunch and Dinner” was held in Wilson Lecture Hall and focused on the importance of reading. Among the audience were many of Franklin’s students as well as other interested students. Franklin’s lecture began with childhood memories of her favorite books, and the moment she realized how much she enjoyed and admired literature. Franklin described the fascination she experienced being able to build images of the places and people depicted in stories with her own imagination. She expressed the value and importance that books hold for children, adults and how important she believes it is to instill that value in children at a young age. Franklin’s concern leans not only towards young people, but adults as well who are not participating in active reading. She finds this is an issue, because reading is a daily skill. In a study she found that 80 percent of adults did not purchase a single book last year, which worried her immensely, leading her to believe that professors today are failing to express the importance of reading skills in societies. Throughout the night, students seemed to thoroughly enjoy Franklin’s presentation. Senior English major Eri Pinto, from Gwinnett, said she was moved by Franklin’s lecture.“I was very touched, and it definitely increased my admiration for Ms. Franklin,” Pinto said. In this week’s Student Government Meeting, SGA members further discussed the previous topic of visitation and alcohol policies, adding a new compacter to campus, a new lecture series and a Senior Village petition and Letters of Intent. So far, there have been no changes to the current alcohol or visitation policies;however, if any changes are to be made they will not take place until the next school year. Due to lack of turn out for The Last Lecture series hosted by SGA, there is a possibility that a new series will replace Last Lecture. This series would be hosted next year. Possible topics include a self defense class or a line-up of guest speakers. In order to make Young Harris a cleaner and more environmentally friendly campus, a new compactor might be added to the campus in order to make recycling easier and more convenient for students, faculty and staff. The compactor would manually separate recyclable material such as glass, paper and plastic. The compactor may also be made available for the community of Young Harris for a fee, despite the recent problems the campus has faced with Young Harris residents coming by and dumping their garbage in YHC’s dumpsters for free. The compactor would be expensive to purchase, but a lease to own program is available, and it would not need to be replaced for the next 30 years. SGA members also had a discussion about a petition that has been circulating around the dorms. The petition states that price of living in the new senior housing being added to campus should be the same as living in Appleby Center, simply because the senior class at YHC is not that large in size. Students were also asked to state on the petition if they would chose to live in the new senior housing once it is finished. So far the majority of students that have signed the petition have stated that they would not choose to live in the Senior Village once it is finished. In further news, Letters of Intent are now available in the Student Development office for SGA’s candidate election for next year. Students should have turned in their Letters of Intent by 4 p.m. on March 30th in the Student development office or at the required Candidate Meeting at 5 p.m. in the Wilson Lecture Hall. Poll’s will open April 12th in and will be held in Goolsby Lecture Hall and Maxwell Math and Science Building from 9 a.m. to 11 a.m. and in the Rollins Dining Hall from 12 p.m. to 2 p.m. The Student Government Association had their first public, weekly meeting of the 2011 Spring semester. In this meeting they discussed things such as the ice on the sidewalks, an extension for Drop/Add Week, Last Lecture Series and Freshman Forgiveness. Due to the weather conditions, classes began a day and a half late this semester; and with snow and ice lingering throughout campus, there was concern from students over slipping on the ice on their way to and from classes. SGA President Matthew Kammerer spoke with the grounds staff about this potential hazard. Throughout the day the grounds staff salted and used all of the manpower that they could spare to make the campus safer to walk through; and while some icy spots remain around campus, several walkways have been cleared, such as the walkway from the cafeteria to Goolsby Lecture Hall. While the ice problem is still present, SGA will be working on ways to make it safer for students. Also, the Academic Affairs subcommittee in SGA is working to get Drop/Add Week extended through next week. Drop/Add Week is a chance for students to make changes to their schedule by dropping or adding classes. Because of the weather delay, SGA was able to get Drop/Add Week extended until next Wednesday. Among other SGA news, the Last Lecture Series will be coming back to YHC this semester. 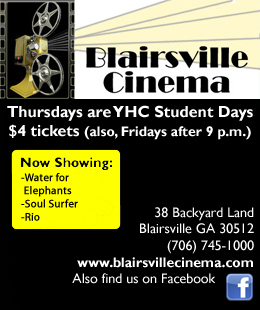 This series features a YHC staff member that gives a presentation on any topic if it was their last lecture. The next Last Lecture is scheduled for January 20. The speaker will be announced at a later date. Freshman Forgiveness has been enacted as of this semester. Despite the name ‘Freshman Forgiveness’ this opportunity is open to any student who receives a D or an F in a class and wishes to retake the course. Freshman Forgiveness can apply to any course you take, but pick these courses carefully, since you can only retake two classes for the entire time that you attend YHC. SGA meets weekly in the dining hall on Wednesdays at 5:30 p.m. All students are welcome to attend. Have you ever wondered what a professor would choose to teach if he or she had only one more chance to do so? Members of the Young Harris College community gathered together Tuesday night to find out. Hosted by the Student Government Association, Last Lecture is an event that gives staff, faculty and students an opportunity to teach a lecture on a topic they otherwise would not be able to give. Dr. Paul T. Arnold, dean of the division of mathematics and science, was the first professor invited to share his “last lecture”. Dr. Arnold opened his lecture entitled “Oath of Lasagna” with a series of slides depicting all the things he is passionate about. He described his love for music, fishing and fine arts. In the end, he admitted that the things he was most passionate about included food and sleep which took up most of his day. However, this was not what he intended his lecture to be about. The word Lasagna may have been included in the title, but its reason for being there pointed towards anything but food. Dr. Arnold explained that Lasagna referred to a physician by the name of Louis Cesare Lasagna, who revised the Hippocratic Oath. The oath outlines the values and standards physicians must uphold in their practice. He considers this important to everyone’s daily lives. He then began to outline every section of the oath and explained its significance. Arnold also described his passion for science and what it has done for him. “Science has allowed me to see in a much broader way. I always clearly saw my side of an argument, but I learned to see everyone else’s side too,” Arnold said. Not only has science helped to broaden Arnold’s perspectives, he considers the subject to also be an art form. “Science is a different version of art, and definitely has a place in a liberal arts college,” Arnold said. Arnold continued to keep the audience’s attention throughout the lecture by cracking jokes and comparing the topic to everyday life. He emphasized the importance of staying passionate about what interests you. “Use your passion to get involved with something greater than yourself,” Arnold said. By the end of the lecture, the audience could relate themselves to the Hippocratic Oath and also knew more about Dr. Arnold than ever before. SGA plans to continue this event 2-3 times a semester. They encouraged everyone to get involved and for students and faculty to submit names of someone they wish to hear give a last lecture. 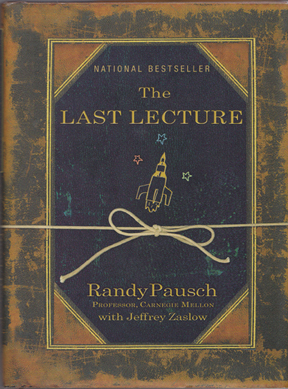 The Last Lecture by Randy Pausch sold over 700,000 copies. At Wednesday’s SGA meeting, student representatives finalized plans for Dr. Paul Arnold’s Last Lecture as well as new ways to get student feedback on a variety of campus issues. Arnold, associate professor of biology and dean of the division of mathematics and science, will be giving his lecture in the Wilson Lecture Hall at 7 p.m. on Tuesday, October. 5. All students are encouraged to be a part of this by coming and listening to Dr. Arnold speak on the topic of his choosing. The idea behind the Last Lecture stems from Randy Pausch. Pausch was a professor of computer science at Carnegie Mellon University. He decided to give his Last Lecture when he was diagnosed with pancreatic cancer. Shortly after his diagnosis, Pausch lectured on how to achieve your dreams. Ten months following the lecture, Pausch lost his battle against pancreatic cancer. While Dr. Arnold is not battling a terminal illness, the Last Lecture program was inspired by this idea, so that if a professor or faculty member were to leave, they could speak on whatever it is they would want students to know before they leave YHC. The lecture can be about absolutely anything. It is not confined to just that person’s department. Along with more solid plans about the Last Lectures, Tell-Me-Tuesday, which is a program to get student feed-back on improvements they want on campus, is officially in the works. The first one will be on Tuesday, October 5. A golf cart with one adult and one SGA member will come around to pick up random students and take them quickly from one destination to another. While riding the SGA member will ask a set questions to the student on what improvements they would like to have on campus. They will do this in twenty-minute increments on Tuesdays. The times of these rides for this Tuesday will take place between 9:15 to 9:35 a.m., 10:45 to 11:45 a.m. and 1:45 to 2:05 p.m. on Tuesdays. In addition to making improvements on campus, SGA will be meeting with the Office of Information Technology to address any technological concerns students might have. All students are highly encouraged to voice any questions or concerns they may have by sending a e-mail to sga@yhc.edu. Any and all questions are more than welcome. UPDATE1(12:22 a.m., 10/1/10) Added link to Randy Pausch’s Last Lecture.